Electronic cigarette portable charger case AdvancedPRO. Portable Charger Case (PCC) which looks like an ordinary pack of cigarettes to store and protect your NUCIG and cartridges. Once the PCC has been fully charged, there is no need for mains charging for several days. The PCC will re-charge and top up your used NUCIG battery for upto 5complete cycles - never be caught out with a battery which runs flat during the day again ! When charging is required - simply connect the PCC to a power source, either USB connector on your laptop/computer or wall mains charging. 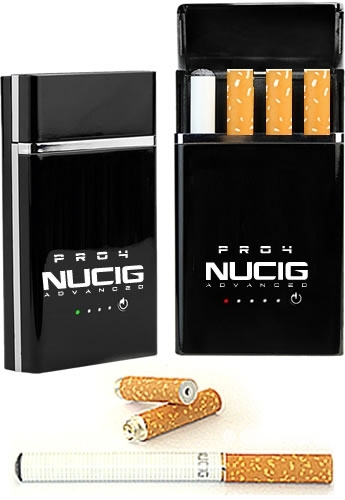 Note: NUCIG Filters/batterys shown are for display only and available as separate purchase. I LOVE THIS CHARGER I walk my dog a lot and it makes carrying my Nucig easy and l can spend as long as I like out as I have a charged one with me. Thank god for this neat box of tricks ! I can now have one NUCIG to use whilst the other is on charge - wireless charging at its best ! I spend a lot of time with clients - so this box is perfect for my jacket inside pocket. Works OK but AS A HEAVY SMOKER I've gone on to the Ultimate Tank II system which I like even better than real rollups, with a mixture of 26mg cigar, tobbaco, and like virginia liquids. Get over the pretty cigarette look and GET A TANK II !!! sturdy, works well and holds 2 batteries (one on charge and one with filter) plus 2 additional filters. Feels a little larger in the hand than it appears in the pictures, and i am a little concerned that the plastic tags that hold the lid closed look a little fragile, but time may prove me wrong on this. At the price seems like good value.